David Beckham should be among the traveling party when AC Milan visit Rangers on 4 February. "We are excited about it," said Rangers captain Barry Ferguson. "It will be great for the young kids to see some of the superstars in football like Beckham, Kaka and Ronaldinho." Beckham starred in an Ibrox friendly back in 1994, when Manchester United were 1-0 losers, while he was in the England team that won 2-0 in a Euro 2000 play-off match at Hampden. CLICK HERE to view an BBC Sport interview of David talking about the upcoming match. If you live in Scotland, and would like to see David, Kaka and Ronaldinho play you can get ticket information from the Rangers official club site. I few of you have been asking me about Victoria Beckham's YSL Trib Two heels. I was in Selfridges the other day and these heels have been reissued for this Spring season in leather, but not the patent Victoria is wearing. The new version has a gold sole, not black, like Victoria's, and not blue like the picture above. The heels cost £475, and you should check your local YSL store, or luxury department store to see if they have them. David Beckham asked to be substituted in the 1-1 draw against Genoa on Wednesday with an abductor muscle injury in his groin, but hopes to be fit for Milan's game against Lazio on Sunday. Beckham said: "I felt it before the game and then again just before half-time. I got to 20 minutes in the second half and I felt it a little more. It's painful but hopefully I will be fit for the game at the weekend." David added that he had not spoken to Capello. He said: "The most important thing is that I concentrate on my game here and my fitness. If I get in the England squad, great. Everyone knows how much playing for my country means to me." 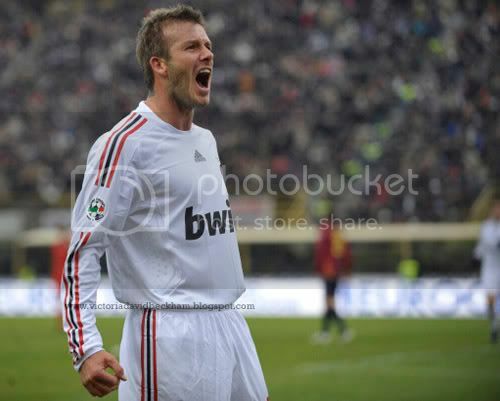 David Beckham scored the first goal from a wicked free-kick tonight on 32 minutes against Genoa. The game ended up being a 1-1 draw, but David's free-kick would have no doubt impressed England coach Fabio Capello, who was watching in the stands. David, forever the gentleman celebrated his goal by running over to the subs bench and shakes his hand. He has to stay now right? According to Tim Leiweke, president and CEO of LA Galaxy the answer is NO. "David is under contract to the Galaxy, and I had a good, straightforward conversation with him before he left and he loves it in LA." "He wants a better Galaxy team, we're going to have a better team and David has no interest in going." "We have a contract, we have a handshake, his kids go to school here, end of story. There is no story. He's going to return to the Galaxy." Well, it’s been another good week at Milan. Obviously, to score a goal in only my third Serie A match was great and I’m definitely going to keep my shirt to mark the occasion, but I’m also pleased with the way we played, especially away from home and to come back from a goal down to win 4-1 shows the character and quality of the team. We’re all working hard for each other and the results are showing. We’re still six points behind Inter, but our form is good, so we just want to keep going and see what happens. We’re at home to Genoa tonight, who’re four points behind us, so the match is great opportunity to really push on, away from the chasing teams and try to catch the two teams above us. We’re confident and really looking forward to the game. Victoria Beckham took her sons out for a ride around LA in her white Porsche 911 Turbo Convertible. Sporting a pair of sunglasses and carefully maneuvering around the heavy traffic as her boys looked on. Hopefully something more exciting will happen soon. Could these two be any hotter? Here are is a short video of David and Victoria Beckham's Emporio Armani advertising campaign, with some additional pictures of David looking hotter than ever. AC Milan's Andrea Pirlo, (L) and Clarance Seedorf (R) congratulated David Beckham after he scored against Bologna with a friendly pat on the behind. There is actually a reason why they did this, and it's explained below. An AC Milan insider said: "Everyone knows Beckham has a golden touch and he has proved that since he arrived". "Italy is a superstitious country and people often touch things for luck - the players are doing the same with Beckham and touching his bottom because he is seen as a lucky mascot." Victoria Beckham was seen shopping at the Grove yesterday with Cruz and her parents. She was wearing all black - as we have come to expect - and carrying a Miu Miu bag we saw her carrying last year. To see more 30 more pictures from her shopping trip click here. Victoria Beckham arrived back in LA on Sunday following her stay in Milan. Since we saw her leave Milan on Thursday, I will assume she possibly was in London for a few days before traveling onto LA. Victoria was wearing head to toe black wearing a satin black tunic, black pants, YSL Trib Two pumps, dVb glasses and her Loewe 'Calle' Bag. Her look was without one of her Dolce & Gabbana headbands she has grown to love. Here's a quick post match interview. David Beckham scored his first goal for AC Milan in the Italian club's 4-1 Serie A victory against 10-man Bologna. His goal came after 2 goals from Kaka, and another from Clarence Seedorf. David is set to return to the MLS on March 9, but at this rate he looks to be having so much fun, the question is now will he return? So far, Beckham has started all three of Milan's matches since he arrived. Unlike 2 other Victoria Beckham sites who etched out the tags from my Vogue Russia scans, and then claimed my scans as their own, Pink Is The New Blog was decent enough to credit my site for the scans. So a big thank you to him. I gotta tell you I am loving these pictures from inside the Fendi Party. Victoria Beckham looks even more beautiful in these pictures. After the event David got his wife a single white rose. So romantic. I adore this couple. Who Wore Stella McCartney Better?